Not suitable for work? This is how the microwaved dogs look after two minutes under fire. Nobody said having fun was going to be easy. This evening we had 'em again, but this time the veggies included sliced purple potatoes, garlic and snow peas. You add the snow peas at the very end of the steaming, of course, so as not to overcook. Wicked delicious. 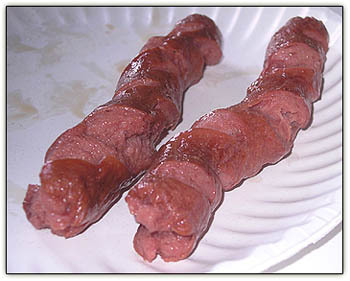 Best with "Hebrew National Quarter pound Dinner Franks". Next best is Nathan's quarter pounders. We didn't have microwave ovens when I was a kid so we put a couple of ten penny nails through a board, attached some wire, put the dog on the nails than plugged it in to the wall socket. Quicker than microwave. Nathans hot dogs are incredible! That's my favorite thing about shopping at Costco! You can get a Nathan's hotdog and a soda for $1.50! We ALWAYS stop for a dog on our way out!